There are so many unborn babies that continue to lose their lives through abortions. What else can we do besides prayer, to help save the lives of these babies? Our Lord told this to one of the Knights that prays at an abortion clinic. "Lord, will this really touch women that are going to the abortion clinics and help save their babies lives?" He heard Our Lord respond in his head with such a powerful "Yes" that it shook his entire body. 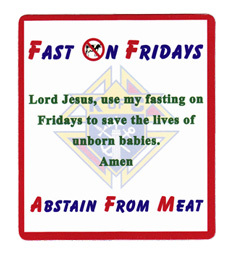 Fast Fridays, Abstain from Meat. Offer up your fasting to help save the lives of unborn babies that might be aborted. You can do it! How many unborn babies' lives might you save? If you are having trouble viewing the Knights of Columbus Fast on Fridays video to the left, please be sure to update your Quicktime Player, or enable multimedia streams in your browser. Quicktime 7 for Microsoft Windows is now available. Click Here to visit the download page for the most up-to-date Quicktime version.